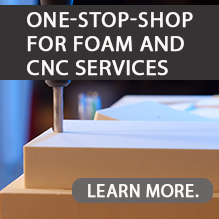 LAST-A-FOAM® TR-Series Marine high density polyurethane foams are specially formulated to meet the physical property demands of FRP-composite boat builders. These marine polyurethane foams provide structural strength with moisture resistance, enabling boat designers to replace wood components with a top-quality, non-decaying product. This product is fully compatible with fiberglass-laminating production methods. This series is non-abrasive and can be machined with standard high-speed steel (HSS) cutting tools. It can also be cut cleanly with water jets and traditional wood-carving tools. Our marine polyurethane foams are produced in a range of densities, allowing designers and engineers to best align physical properties with structural needs. For maximum economy, use the materials matched to the anticipated stresses. Production boat builders also rely on General Plastics for CNC-machined finished parts. We cut transoms, stringers and other special shapes with top-quality high-density foam that’s ready to use, with no wasted time or materials. We are adept at maximizing the yield of the material we machine. In addition, we can kit your parts to streamline production in your factory. Shown are maximum standard sizes based on density. Custom sizes are available. Cut sizes are available from 0.125 inches (3.175 mm) up to standard stock heights as listed above.